René de Guzman’s office is a little more exposed than it was a couple of weeks ago. 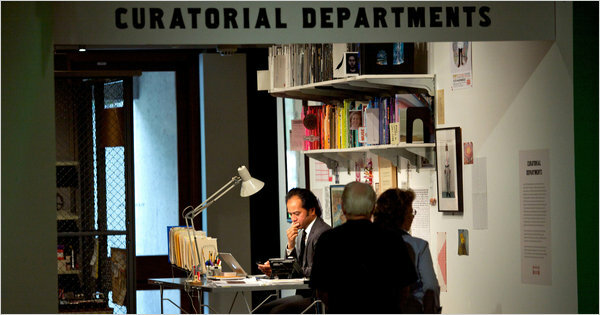 From close up, the headquarters of the senior curator of art at the Oakland Museum of California mostly looks the same. Mr. de Guzman’s laptop and phone occupy their usual spots on his glass-topped desk. The walls are covered with sketches and paintings. But instead of sitting behind a closed door in the museum’s administrative wing, Mr. de Guzman is on display to the public as he works at his desk alongside the art displays. Over the next six months, the curator will conduct his business from this transplanted work space, adding an element of live performance art to the institution’s collection of predominantly static paintings, sculptures and installations. Mark Dion, a conceptual artist based in New York, came up with the idea of transporting Mr. de Guzman’s office to the museum floor as part of a new exhibition he created. “The Marvelous Museum,” which opened on Saturday and runs until March 6, seeks to reveal aspects of the Oakland Museum that are normally hidden from public view, including the curatorial process. By challenging the Victorian view of museums as lofty custodians of a sacred artistic canon, visual arts institutions are trying to make themselves more approachable and responsive to their visitors. The practice of inviting artists to intervene in the curatorial process is not new. It dates to the conceptual projects of the 1960s and ’70s by such artists as Hans Haacke and Michael Asher. “The Marvelous Museum” shares traits with a 2009 exhibition by Vincent Fecteau, a local artist, of rarely displayed artifacts drawn from the San Francisco Museum of Modern Art’s holdings. Nevertheless, Mr. Dion’s quirky curatorial vision is fresh and at times arresting. Transplanting Mr. de Guzman’s office to the exhibition hall reveals, if nothing else, just how unglamorous the job of a curator can be. In addition, Mr. Dion has ransacked the museum’s storage areas for obscure objects to interject alongside the permanent collection. The juxtapositions seem trite in places: An ancient Micronesian stone “coin,” for instance, does not reveal much about itself or the nearby artworks in a gallery devoted to the Gold Rush. But in excavating such curios as a saddle fashioned from a buffalo’s pelvis bone and a collection of improvised prison weaponry including a gun made out of a piece of sawed-off piping, Mr. Dion inspires a sense of wonder about these formerly hidden objects and curiosity about what else remains obscured. Other museums in the region are also pursuing increased openness. When the de Young Museum re-opened in Golden Gate Park in 2005, transparency was built into its architectural design, with glass walls enabling people to see inside the museum from the outside and outside from within. “We aim to carry that metaphor into everything we do,” said Robert Futernick, the associate director of the Fine Art Museums of San Francisco, which comprises the de Young Museum and the Legion of Honor. The organization has more than 100,000 works in its collection, approximately 3,000 of which are on display at any time. But thanks to an extensive Web-based catalog of its holdings, members of the public can view items in storage online and make an appointment to visit the museums to study the pieces. The current “Reinventing Ritual: Contemporary Art and Design for Jewish Life” exhibition at the Contemporary Jewish Museum features video labels of artists talking about their processes. “We want to allow artists to speak for themselves rather than having a curatorial voice telling you what artists think,” said Dara Solomon, the associate curator. Curators see the increased transparency as a positive development for art institutions for the most part. “If an institution is willing to question its values and come to terms with how others approach those values, then it’s strengthening its ability to do what it does,” said John Zarobell, the assistant curator of painting and sculpture at the San Francisco Museum of Modern Art. But it comes with certain drawbacks. Since putting its collection online, the Fine Art Museums of San Francisco have had to service a much higher number of expensive loan requests from other art museums. And the Contemporary Jewish Museum has installed a sign in the gallery where a scribe sits writing the Torah to inform curious visitors to keep their questions for designated sessions so the scribe can get on with her work. Over at the Oakland Museum, Mr. de Guzman said he was not too worried about meeting his deadlines. “I don’t think that sitting in the gallery is going to be much of an inconvenience,” he said. “I’m committed to engaging the public. That is my work.